DC Pin Size: Rectangle USB Type Yellow Tip With Pin Inside. Size of Connector: 11mm x 4.6mm (USB Rectangular Tip). Dispatch without box in padded envelop. 100% compatibility with the original. DC Pin Size: Rectangle USB Type Yellow Tip With Pin Inside. Size of Connector: 11mm x 4.6mm (USB Rectangular Tip). Dispatch without box in padded envelop. one year warranty included. DC Pin Size: Rectangle USB Type Yellow Tip With Pin Inside. 100% compatibility with the original. Power 65 Watt. Condition is new. DC Pin Size: Rectangle USB Type Yellow Tip With Pin Inside. Size of Connector: 11mm x 4.6mm (USB Rectangular Tip). Dispatch without box in padded envelop. No software will be loaded onto any systems unless stated otherwise, all drives are wiped. IBM (08K8202) Power Supply - 16v 4.5A - Charger. Good Working Order. See Photos for Info. Output connections - inner cylinder ( ) (not a center pin) outer cylinder (-) No Returns. Thinkpad 570, Original IBM version, Pentium PII, Laptop, for collectors . Comes together with original ultra base and charger. Windows xp installed. Works perfect. Condition is Used. Dispatched with Royal Mail 2nd Class. DC Pin Size: Rectangle USB Type Yellow Tip With Pin Inside. Size of Connector: 11mm x 4.6mm (USB Rectangular Tip). IBM ThinkPad Z60 Series: ThinkPad Z60, ThinkPad Z60m, ThinkPad Z60t. IBM ThinkPad Z61 Series: ThinkPad Z61e, ThinkPad Z61t IBM. IBM ThinkPad T60 Series: ThinkPad T60, ThinkPad T60p. Genuine IBM Lenovo part. GENUINE IBM. AC ADAPTER. USED IN GOOD CONDITION HOWEVER. AS IM WILLING TO 100% COMMUNICATE AND. DOES HAVE MINOR MARKS NOTHING MAJOR. SORT OUT THE ISSUE STRAIGHT AWAY. GRAB YOUR SELF A BARGAIN . Type: Laptop AC Adapter. Laptop Screens. Laptop Adapters. Adapter Output: 20v 2A. Laptop Hard Drives. Adapter Input: 100-240V~1.5A 50-60Hz. Laptop adapters from various other adapter manufacturers can be used as long as the specifications are similar to the existing adapter. DC Pin Size: Rectangle USB Type Yellow Tip With Pin Inside. Size of Connector: 11mm x 4.6mm (USB Rectangular Tip). Dispatch without box in padded envelop. Warranty 1 Year. one year warranty included. P/N 02K6704. 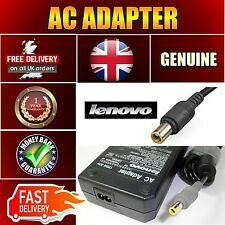 72W AC Adapter - UK. Manufactured for Lenovo. Genuine IBM Lenovo part. IBM ThinkPad Z60 Series: ThinkPad Z60, ThinkPad Z60m, ThinkPad Z60t. IBM ThinkPad Z61 Series: ThinkPad Z61e, ThinkPad Z61t IBM. IBM ThinkPad T60 Series: ThinkPad T60, ThinkPad T60p. DC Pin Size: Rectangle USB Type Yellow Tip With Pin Inside. We will be great full to resolve the matter asap. 100% compatibility with the original. Adapter Output: 20V 3.25A. Type: Laptop AC Adapter. Laptop Screens. Laptop Adapters. Laptop Hard Drives. Adapter Input: 100-240V~1.5A 50-60Hz. Laptop adapters from various other adapter manufacturers can be used as long as the specifications are similar to the existing adapter. 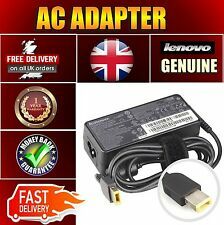 Genuine Lenovo ADLX45NCC3A Adapter Charger 45W REFURBISHED Guaranteed to meet the specifications of your laptop. Built in Over Temperature Control. Built in Over Voltage Protection. Built in Short Circuit Protection. Built in Current Protection. Fire retardent casing. FREE power cable is included. Sealed for protection against moisture and humidity. Certified for safe use in UK and Europe. REFURBISHED COMES WITH 3 MONTHS WARRANTY. 65W 20V 3.25A. 45N0257. Fully Tested. This is a genuine Lenovo part. They are used but fully tested. May have minor signs of wear. 3pin power lead included. 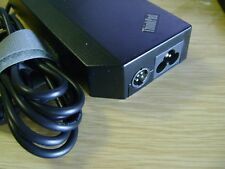 Compatible with Lenovo Thinkpad notebooks with rectangular “slim tip” common power plug. Adapter Output: 20v 4.5A. Type: Laptop AC Adapter. Laptop Screens. Laptop Adapters. Laptop Hard Drives. Adapter Input: 100-240V~1.5A 50-60Hz. Laptop adapters from various other adapter manufacturers can be used as long as the specifications are similar to the existing adapter. Adapter Output: 20V 4.5A. Type: Laptop AC Adapter. Power Cable: 3 Pin Cable Not Included. Adapter's part no. / model no. or model nos. Even though if the part nos. / model nos. Adapter Output: 5V 2A. Type: Laptop AC Adapter. Adapter Input: 100-240V~1.5A 50-60Hz. Pin Size/ Type: USB Type. Adapter's part no. / model no. or model nos. Even though if the part nos. Genuine IBM AC Adaptor for Laptop. In good working order. DC Pin Size: Rectangle USB Type Yellow Tip With Pin Inside. 100% compatibility with the original. Output Current: 3.25A. DC Pin Size: Rectangle USB Type Yellow Tip With Pin Inside. 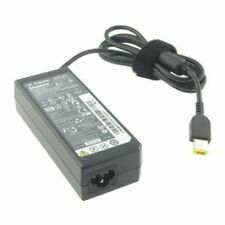 GENUINE IBM LENOVO THINKPAD LAPTOP UK 72W AC POWER ADAPTER AND POWER CORD P/N: 93P5017. Adapter Output: 20V 2.25A. Type: Laptop AC Adapter. Pictures of the Product - illustration purposes only. Adapter Input: 100-240V~1.5A 50-60Hz. Adapter's part no. / model no. or model nos. Even though if the part nos. Adapter Output: 20V 2.25A. Type: Laptop AC Adapter. Power Cable: 3 Pin Cable Not Included. Adapter Input: 100-240V~1.5A 50-60Hz. Pin Size/ Type: USB Type. Adapter's part no. / model no. or model nos. Type: Laptop AC Adapter. Laptop Screens. Laptop Adapters. Adapter Output: 20V 2.25A. Laptop Hard Drives. Adapter Input: 100-240V~1.5A 50-60Hz. Laptop adapters from various other adapter manufacturers can be used as long as the specifications are similar to the existing adapter. Adapter Output: 20V 8.5A. Type: Laptop AC Adapter. Laptop Screens. Laptop Adapters. Laptop Hard Drives. Adapter Input: 100-240V~1.5A 50-60Hz. The one which we have listed has 7.9mmX5.5mm. Laptop adapters from various other adapter manufacturers can be used as long as the specifications are similar to the existing adapter. Type: Laptop AC Adapter. Laptop Screens. Laptop Adapters. Adapter Output: 20V 3.25A. Laptop Hard Drives. Adapter Input: 100-240V~1.5A 50-60Hz. Laptop adapters from various other adapter manufacturers can be used as long as the specifications are similar to the existing adapter. Adapter Output: 20v 3.25A. Type: Laptop AC Adapter. Adapter Input: 100-240V~1.5A 50-60Hz. Laptop adapters from various other adapter manufacturers can be used as long as the specifications are similar to the existing adapter.